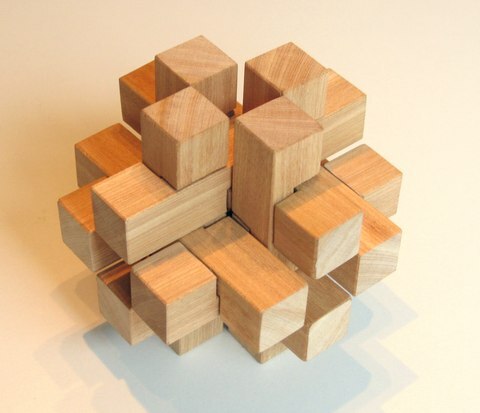 I like this puzzle for its simplicity of construction, yet difficulty in assembly. Once assembled it holds together well enough that it can be tossed in the air and caught without coming apart. The neat thing about this burr is that it's made out of 12 identical pieces. The geometry of the pieces is very simple. Think of the piece at left as comprised of five cubes with the three middle cubes half cut away. I used 20 mm for the basic unit, so the pieces are 20x20x100 mm in size. 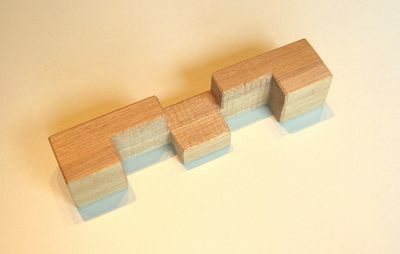 If you make one, be sure to make the notches a bit wider than the basic cube size and to slightly chamfer or sand all the edges a little bit so that it won't jam when you assemble and disassemble it. I'm not attempting to describe how to assemble it with photos because I need both hands when getting the last few pieces in. I hope the video will help you figure it out.